I'm having the opportunity of importing a black, untitled (ready to be titled this spring, according to the seller) Margman female. She's a litttermate to the female on the "mating outcome" (I won't register a dog that isn't mine or in the pedigree of one of my dogs), and having her bred to Timon vom Kirschental to import and keep one or two pups for my nascent breeding program. While I understand that color may be an issue for some, I believe that temperament will be an asset and conformation should also be well above average and that such a litter is not often seen in the US. Her pedigree presents some opportunities... having Timo (actually linebred 7-3 on him) and Ursus relatively close and a good number of dogs known for their performance in protection is an asset. Timon also brings a solid pedigree with Esko von Danischen hof, Odin(actually his parents Yak & Riska) , Furbo and Kalli all in the fourth generation and strong performers closer yet. I have substantial expectations of this litter on the field, ring and eventually as reproductors. Breathtaking pedigree, especially on the Dam's side. I think the dam’s breeding is excellent for what you are pursuing...and the breeding is going in the right direction. I think the female you are importing has an amazing pedigree and is a potential superstar breeding female for your breeding program. You are bringing alternative, well balanced alternative show lines that are great to breed with any other line. Best of luck with your new female! About the prospective litter, I think there are better dogs out there than Timon but it certainly is a great mating anyway! The good thing about dominant black is that if you don't want to keep the color in your breeding lines, you just don't keep a black dog. The non-black pups in the litter won't have the dominant black gene, so you can breed away in one generation -- if that's what you want to do. Likewise, it's easy to keep in the breeding program if you want to. It is true that there are better dogs out there than Timon, But given my intent to breed around Dux de Intercanina, Ballack and speciffic dogs (Yukon v der Bastillie, Kevin v Murrtal, Nero v Nobachtal, Vegas, the "O" v Radhouse litter) & lines known for solid temperament (Arlett, Kirschental, Tronje among others), Timon presents a very nice package of conformation and very solid and stable temperament with a potential upside for his progeny as he's already produced a V rated son (Miro Vom Hornpfad, full brother to our Nelli) who was SG33 as a young dog at the BSZS. I'll be the first to say that this litter is not to produce "the dog", but a very significant stepping stone on the way to that point. Plans for the female include dogs with signifficant aggression, solid temperament and at least V conformation rating that are consistent to our objectives. There are other prospective litters for late this year or early 2020: Clifford von Arlet with Kalkutta von Arlett: http://www.pedigreedatabase.com/german_shepherd_dog/breeding.result?father=2765251&mother=2728857 A very Arlett litter that will bring together Nino v Tronje and Gary v Huhnegrab... There is some very nice linebreeding on Xtra v Tronje, Irok, Flipp & Ghandi. Should be a very nice litter. Ida von Arlett with Fino von Piste Trophe: http://www.pedigreedatabase.com/german_shepherd_dog/breeding.result?father=2381286&mother=2719349 Also a very Arlett litter with a great deal of potential. 4-4 on Yukkon, 3-4 on the R vom Fichtenschlag litter (Remo/Rhonda) and 5-5 on Zamp. Ida Carries Latini v d Quartier Latin and Iexpect her pups to bebred to the Timon/Margman Pepper's litter. Koller vom Bergmannsland & Nelli vom Hornfad: http://www.pedigreedatabase.com/german_shepherd_dog/breeding.result?father=2417608&mother=2751256 A somewhat ambitious litter with emphasis on balance and temperament. Koller is a Sabat son out of an Intercanina female. I'm very impressed with him and his breeding. Nelli is a very strong tepmered female out of Timon v Kirschental and Gundi v Hornpfad (Ober v Bad Boll and Rico v Spittafeld granddaughter) with a lot of energy and a very Kirschental temperament. And one more imported litter: http://www.schaeferhunden.eu/winsis_x/winsisshowdog.php?tp=11&tpi=0&bb=&id=2337225&bbs=&ids=2326221 A bi-colored Landos grandson and a Margman Yes son (he's Peanut's and Pepper's father) out of a very nicely bred working lines female. Willa is a very nice female of Ulmental and Kirschental lines out of the same kennel that bred Peter Send's current competitor, Urex vom Gebembacher Land. I have some interesting plans for this very nice female. Also on deck is an importation of yet another female out of a mostly Kirschental lines male and a Piste Trophe female that won't be ready until late 2020. I hope this helps to flesh out a bit of what I look forward to attempting in the following two to three generations. And yet, they are used by a good number of reputable, knowledgeable SV & FCI breeders. 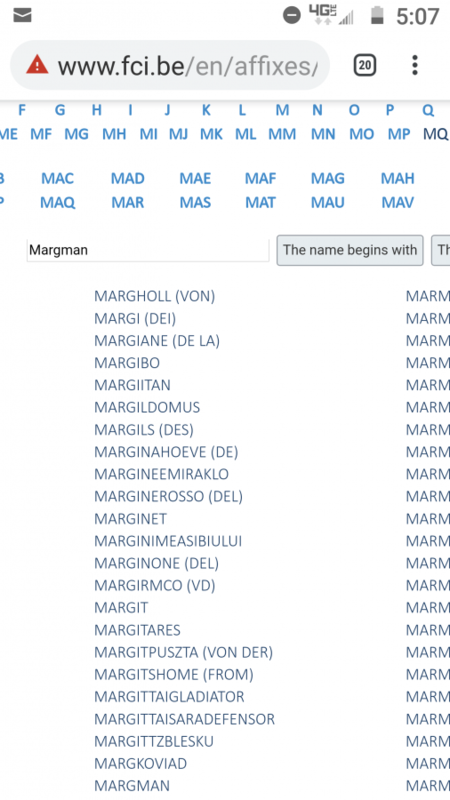 A few years ago, I was interested in purchasing a Max von Team Arlett son out of Margman Xara from Arlett kennel... Also, I went to FCI website and Margman is in their breeder database. @charlie319 Thanks for sharing your ideas for the future - great to read your enthusiasm and you clearly seem to have a clear plan for your next generations. Do you have a website where I can follow your kennel? Not yet. But that should change this summer. I'm in the process of transitioning into a more rural location and will have my hands full with the logistics of the move and erection of proper kennel space, fencing, etc. There will be time for logos and webpage design. In the meantime, the planned breedings will speak for themselves. I do have a small Facebook page. Vom Pfeilspitzen Land... In a dog/handler team, the dog is often "the tip of the spear" buying the handler time for a more effective engagement. Also, Kansas, where I live was once the edge of civilization. The land of Billy the Kid and The Wild West... and in honor of the history of Native American presence in what is now the State of Kansas I chose the name. Feel free to come visit.